With so many great breweries in town, the barrier to entry for the new brewers is pretty tough. And the bar has been set awfully high. But that’s good. That means the newbies have to come out of the gate with quality brews if they’re going to have a chance of survival – and most of them do. If you’re going to be here for a visit (or even if you’re just visiting from another part of town) why not experience some of the breweries that can’t be seen or tasted anywhere else? A lot of the small brewers are doing creative and interesting things, experimenting with new techniques and ingredients, and doing small batches that are here one day and gone the next. Being small and independent gives them the freedom to play around and – while that’s not always a recipe for success – at least it’s interesting. Most of the smaller breweries rely entirely on tasting room sales to stay afloat. Their systems (most of which are 10-barrel systems or smaller) can’t produce enough beer to go into full-scale distribution or even bottling. So the business model for these nano breweries is to sell everything they make through their tasting room. By supporting the small brewers, you’re also supporting the notion that anyone can make great beer on any scale. The more brewers we encourage, the more diversified our talent pool will become, and that’s good for everybody. The typical tasting room at one of San Diego’s nano breweries is housed behind a rollup door in a light industrial office park – not exactly a feature spread in Home & Garden. Concrete floors, simple seating, and inexpensive design are the hallmark of the San Diego small guy. But there’s actually a benefit to going without all the bells and whistles: it makes you focus on the beer. And, let’s face it, even our greatest brewery success stories began in humble basements or garages where our brewers first unleashed their true passion for making beer. It is important to point out a few things about San Diego’s nano breweries. First, with 100+ breweries in the mix, not all the small guys are making gold-medal beer. So, let it be said that just being small is no guarantee of greatness. Second, not all the new small guys are new to brewing. In fact, a number of the really good new breweries in town have been started by brewers who had considerable pro brewing experience under their belts. This family-run operation is headed up by a former brewer from AleSmith who knows his stuff. Their charming tasting room is outfitted with lots of comfortable, “crafty” touches, and the beer is all top-notch. Their brewery is a quonset hut, their bar is a small structure with a rollup door, and their tasting room is a sunny outdoor patio space. Despite the lack of frills, Bolt’s lineup is high quality and nicely varied, with excellent options for hopheads and malt lovers alike. This husband and wife team (she’s the brewer) offer visitors a nice selection of hoppy ales, as well as a number of more interesting, less commonly brewed beers. The tasting room is airy and comfortable, with high ceilings and rollup doors that open to drench the space in sunshine. Set in a semi-residential neighborhood on San Diego’s most beer-centric street, 30th Street, Fall is a cozy and welcoming place that offers a quality lineup and showcases the talents of a longtime brewer who brings his experience from Mission, Maui, and St Archer to this new endeavor. This family-owned-and-operated establishment sits inside a historic two-story house on the corner of Island and 8th. The brewer, who came up at Coronado Brewing, crafts a nice range of small batch, full-flavored beers, all of which pair well with the pub-style menu they offer (try the fish & chips!). A simple, tiny tasting room with 10 taps, this nano offers visitors a nice selection of Irish-inspired beer styles, including malty browns, ambers, stouts, and porters. A few minutes down the street from Ballast Point’s flagship location, this new brewery offers an impressive mix of beer styles and interesting flavor combinations. The tasting room, though simply appointed, is spacious and open with plenty of room to move around. This little brewery came out of the gate with a desire to be different. 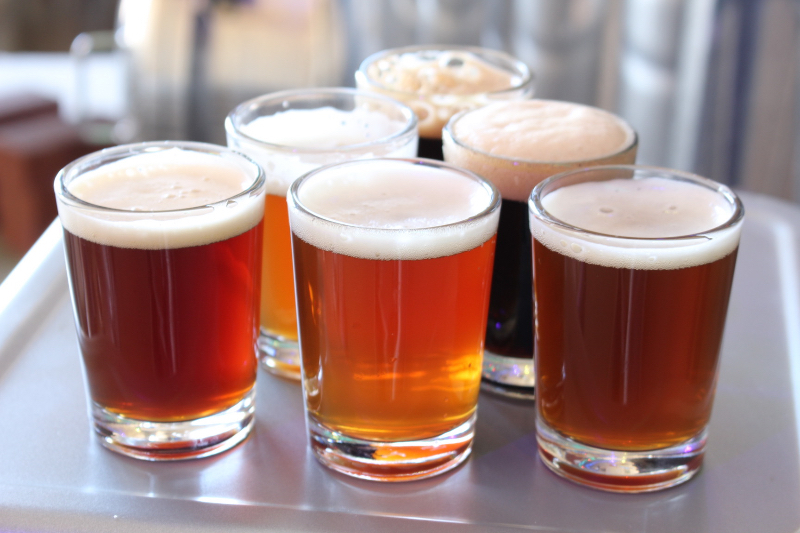 They offer well-made hoppy ales as well as some malty ones, but what distinguishes them is their selection of brettanomyces (wild yeast strain) beers, which produce oodles of sour, funky, fruity, fabulous flavors. This entry was posted in Culinary and tagged craft beer by Bruce Glassman. Bookmark the permalink. Hey Bruce, I couldn’t find a way to contact you on the blog so I left a comment. please send me a email when you have a chance.